Street in ghost town Bodie, California; photo courtesy of Free Public Domain Photo Database: Bodie Ghost Town. Bodie was designated the official state gold rush ghost town of California in 2002 to acknowledge the importance Bodie played in California's history. California also recognizes an official silver rush ghost town. The idea for the measure originated from the students and teachers of Lee Vining Junior High School. Bodie is one of the largest and best preserved ghost towns in the west, offering visitors a special insight into the gold rush days. "Bodie became a boom town in 1877 and by 1879 had a population of approximately 10,000 with 2,000 buildings. The town became more known for its wild living than for its big gold resources - numerous saloons and breweries dotted the mile long main street. 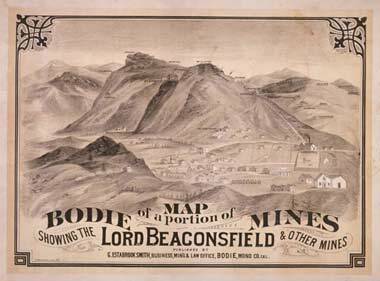 By 1882 the town was in the grips of decline - the rich mines were playing out and mining companies were going bankrupt. Two fires, one in 1892 and the other in 1932 ravaged the business district and Bodie faded into a ghost town in the 1940's. Today, Bodie stands just as time, fire and the elements have left it - a genuine California gold-mining ghost town. Designated a state historic park in 1962, approximately 170 buildings are protected in a state of "arrested decay" on more than 1,000 remote acres, administered by the California Department of Parks and Recreation." (a) The town of Bodie was founded by Waterman S. Body in 1859, and rose to prominence due to mining in the nearby Comstock Lode. (b) At its peak in 1879, Bodie boasted a population of 10,000 citizens and had a reputation for its wicked climate as well as its clientele. (c) By 1882, the big strikes were mostly gone and with them the need to stay in Bodie. (d) One hundred twenty years later, Bodie is one of the largest and best-preserved ghost towns in the West. SEC. 2. It is the intent of the Legislature to enact legislation to commemorate the 120th anniversary of the decline of the town of Bodie from boomtown to ghost town. It is the further intent of the Legislature to join with the students and teachers of Lee Vining Junior High School in Lee Vining, to promote awareness of, and to acknowledge the importance that Bodie played in, California’s rich Gold Rush history. 429.7. 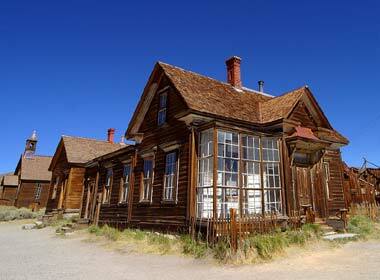 Bodie is the official state gold rush ghost town. Bodie map photo courtesy of the California History Section, CA State Library, Sacramento, California (used by permission).